George Washington – first American president, commander of the Continental Army, president of the Constitutional Convention, and gentleman planter. These were the roles in which Washington exemplified character and leadership. Learn more about the remarkable life of George Washington in our biography below. George Washington was born at his father's plantation on Popes Creek in Westmoreland County, Virginia, on February 22, 1732. George's father, Augustine Washington, was a leading planter in the area and also served as a justice of the county court. Augustine Washington's first wife, Jane Butler, died in 1729, leaving him with two sons, Lawrence and Augustine, Jr., and a daughter, Jane. The elder Augustine then married George's mother, Mary Ball Washington, in 1731. George was the eldest of Augustine Washington's and Mary Ball's six children: George, Elizabeth, Samuel, John Augustine, Charles, and Mildred. In 1734, Augustine moved the family up the Potomac River to another Washington home, Little Hunting Creek Plantation (later renamed Mount Vernon). In 1738, they moved again to Ferry Farm, a plantation on the Rappahannock River near Fredericksburg, Virginia, where George spent much of his youth. Little is known of Washington's childhood, and it remains the most poorly understood part of his life. Popular fables illustrating young George Washington's youthful honesty, piety, and physical strength have long taken the place of documented fact. Some of these fables are more plausible than others. The story that Washington threw a silver dollar across the Potomac River -- an impossible feat -- had its origins in the recollections of a cousin that George could throw a stone across the much narrower Rappahannock River. But others, including the familiar story of Washington and the cherry tree, seem to have been invented by one of Washington's first biographers, Mason Locke Weems. Growing up, George Washington's family owned a lot of property, but they were still not considered "rich" in 18th-century society. When George Washington was eleven years old, his father Augustine died, leaving most of his property to George's older half brothers. The income from what remained was just sufficient to maintain Mary Washington and her children. As the oldest child remaining at home, George undoubtedly helped his mother manage the Rappahannock River plantation where they lived. There he learned the importance of hard work and efficiency. Little is known about George's formal education. Commonly the children of Virginia gentry were taught at home by private tutors or in local private schools. Boys generally began their formal education around the age of seven with lessons in reading, writing, and basic arithmetic. Later they were taught Latin and Greek, as well as such practical subjects as geometry, bookkeeping, and surveying. Wealthy planters often sent their sons to England to finish their schooling, as was done with George's two elder half brothers, Lawrence and Augustine. The death of his father, however, made schooling abroad an impossibility for George Washington. He may have attended a school near his home for the first few years. Later he went to another school, either in Fredericksburg, Stafford County, or Westmoreland County. He excelled in mathematics and learned the rudiments of surveying. But he was not taught Latin or Greek like many gentlemen's sons, and he never learned a foreign language. Nor did he attend college. His formal education ended around the age of 15. Before the age of sixteen, George Washington copied out the 110 rules covered in The Rules of Civility and Decent Behaviour. This exercise, now regarded as a formative influence in the development of his character, included guidelines for behavior and general courtesies. Eager for adventure, George wanted to join the British Navy, but his mother refused to let him. Instead, he accompanied George William Fairfax as a surveyor to the unexplored wilderness of the Virginia frontier. 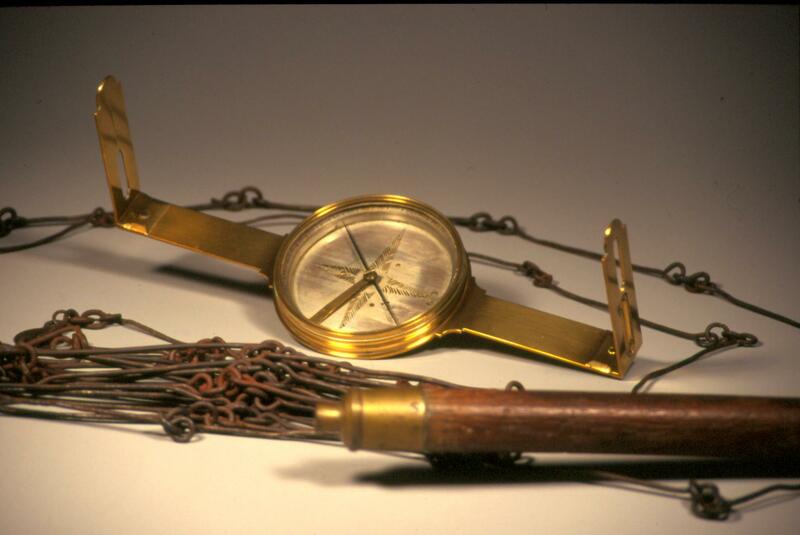 George read mathematical texts to learn the geometric principles necessary for surveying. In July, at seventeen years of age and largely through the Fairfax influence that he had cultivated, Washington secured an appointment as county surveyor for the newly created frontier county of Culpeper. Washington was well on his way to a successful and profitable career. In an effort to establish himself as a member of the gentry class, he worked hard, saved his money, and bought unclaimed land. 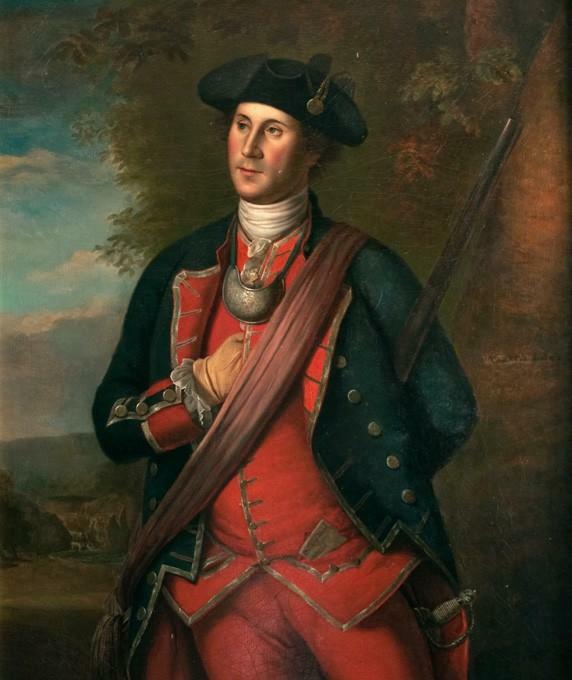 George Washington was only 21 years old when he made a perilous journey across the Allegheny Mountains to command the French to withdraw from the Ohio region claimed by King George II. In 1753 the Governor of Virginia, Robert Dinwiddie, learned that French troops had moved south from Canada and were constructing forts in the region south of Lake Erie, an area claimed by Virginia (but now in Western Pennsylvania). Both France and England recognized the commercial potential of the region. French trappers had been working in the area for some time, and Dinwiddie was concerned that the French troops would also fortify the forks of the Ohio -- the strategic point where the Allegheny and Monongahela rivers join to form the Ohio River. This point, now Pittsburgh, was the eastern gateway to the Ohio Valley. In the fall of 1753 Dinwiddie sent 21-year-old Major Washington to deliver a message to the French, demanding they leave the area. With the help of a frontier guide and local Indians, Washington reached the French fort, Le Boeuf, with Dinwiddie's message. The return trip tested Washington's endurance. He hiked for days through snowy woods, fell off a raft into the ice-choked Allegheny River, nearly drowned, and was forced to spend a freezing night on an island without shelter. His guide, an experienced backwoodsman, suffered frostbite; but Washington suffered no ill effects. 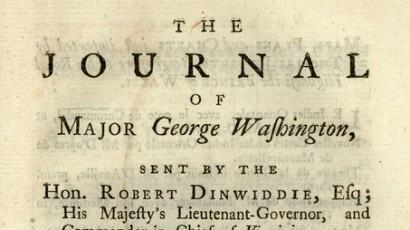 Washington's account of the arduous 900-mile journey was published by Governor Dinwiddie in both Williamsburg and London, establishing an international reputation for George Washington by the time he was 22. A few months later Dinwiddie dispatched Washington, now a lieutenant colonel, and some 150 men to assert Virginia's claims. As they advanced, Washington's men skirmished with French soldiers, killing 10 men, including the French commander. 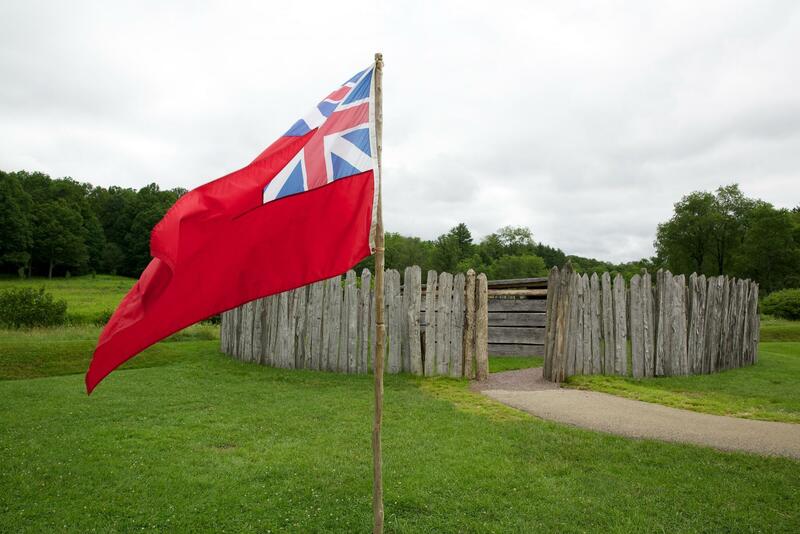 Washington then retreated to an ill-placed and makeshift palisade he called Fort Necessity. He was forced to surrender when the French surrounded the fort. The campaign ended in humiliation for Washington and ignited the French and Indian War. Although he resigned his commission after the surrender, Washington returned to the frontier in 1755 as a volunteer aide to General Edward Braddock. 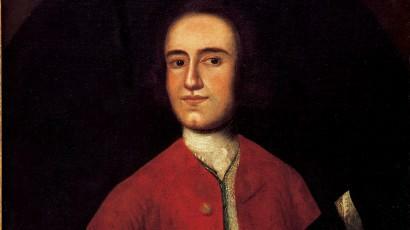 Braddock had been sent by the King of England to drive the French from the Ohio Country. Braddock's army was routed near the Monongahela River and fled in confusion to Virginia. 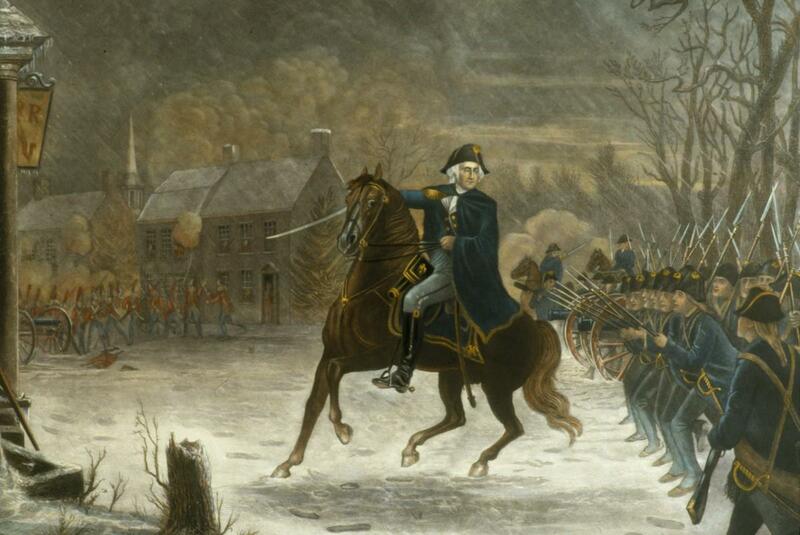 During the battle, while attempting to rally the British soldiers, Washington had two horses shot out from under him and four bullet holes shot through his coat. Although he behaved with conspicuous bravery, Washington could do little except lead the broken survivors to safety. 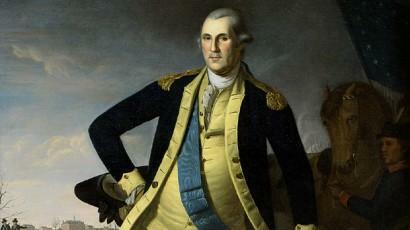 In recognition of his conduct, Washington was given command of Virginia's entire military force. With a few hundred men he was ordered to protect a frontier some 350 miles long. Although this was a frustrating assignment, it provided him with experience in commanding troops through an arduous campaign. In 1758 the British finally took the forks of the Ohio. Peace returned to Virginia, and Washington resigned his commission to return to Mount Vernon, his duty faithfully performed. 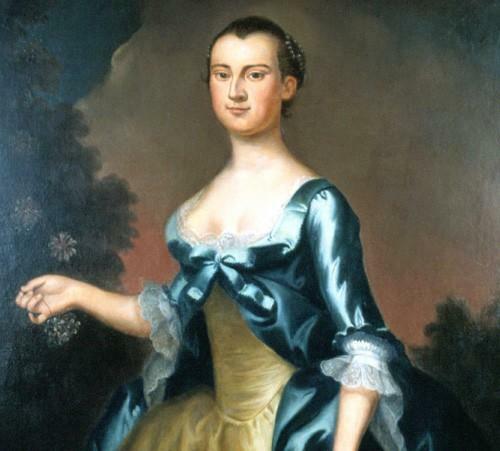 On January 6th, 1759, Washington married Martha Dandridge Custis, a charming and vivacious young woman from the Tidewater area of Virginia. Martha brought enormous wealth, along with two small children, “Jacky” and “Patsy,” to the marriage. It was her second marriage, his first. About two weeks after the battle at Yorktown, Washington’s stepson, John Parke Custis (“Jacky”), died of camp fever at the age of 27. Ironically, the spoiled and indolent young man had not fought in the war but had, at its end, traveled to Yorktown to serve as a civilian aide to his stepfather. He was the last of Martha’s remaining children. His sister Patsy had died as a teenager eight years earlier following an epileptic seizure. Martha was devastated by Jacky’s death. Martha Washington joined her husband in his winter quarters every year of the war. Together they entertained his officers and guests. A patriot in her own right, Mrs. Washington made it her war too, nursing sick and wounded soldiers and raising money for the troops. Needlework helped her to pass the time through the long, cold winters. In all, she would spend about half the war in camp. Two of Martha Washington’s grandchildren, Eleanor (“Nelly”) Parke Custis (b. 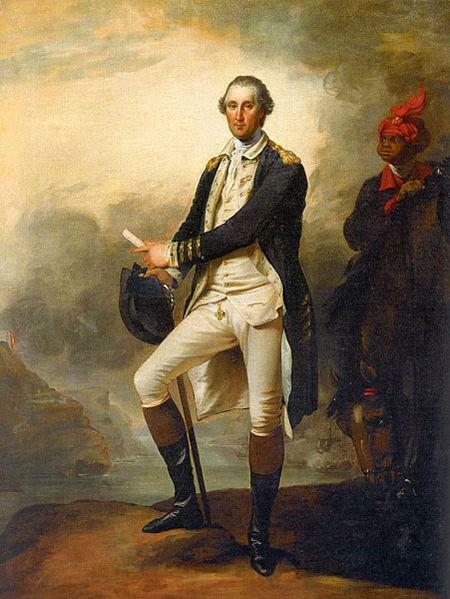 1779) and George Washington (“Washy”) Parke Custis (b. 1781) came to live with their grandparents after their father died following the Battle of Yorktown. Washington loved his step-grandchildren as his very own. The first time George Washington ran for public office, he lost. However, he won his second race and served in the Virginia House of Burgesses from 1758 until 1776. George Washington spent the years between 1759 and 1775 as a gentleman farmer at Mount Vernon. He worked constantly to improve and expand the mansion house and its surrounding plantation. He established himself as an innovative farmer, who switched from tobacco to wheat as his main cash crop in the 1760's. In an effort to improve his farming operation, he diligently experimented with new crops, fertilizers, crop rotation, tools, and livestock breeding. He also expanded the work of the plantation to include flour milling and commercial fishing in an effort to make Mount Vernon a more profitable estate. Over the years, Washington enlarged his house. First he raised the roof to create a third floor. Later he would add a wing to both ends, build a piazza overlooking the Potomac River, and crown his vision with a pediment and cupola. By the time of his death in 1799, he had expanded the plantation from 2,000 to 8,000 acres consisting of five farms, with more than 3,000 acres under cultivation. Shortly after taking up wheat as his main cash crop, Washington built a large gristmill outfitted with two pairs of millstones. One pair of stones ground corn into meal for use at Mount Vernon and the other ground wheat into superfine flour for export to foreign ports. Washington also began making whiskey on the advice of his farm manager, James Anderson, a trained distiller from Scotland. He soon built one of the largest distilleries in America. 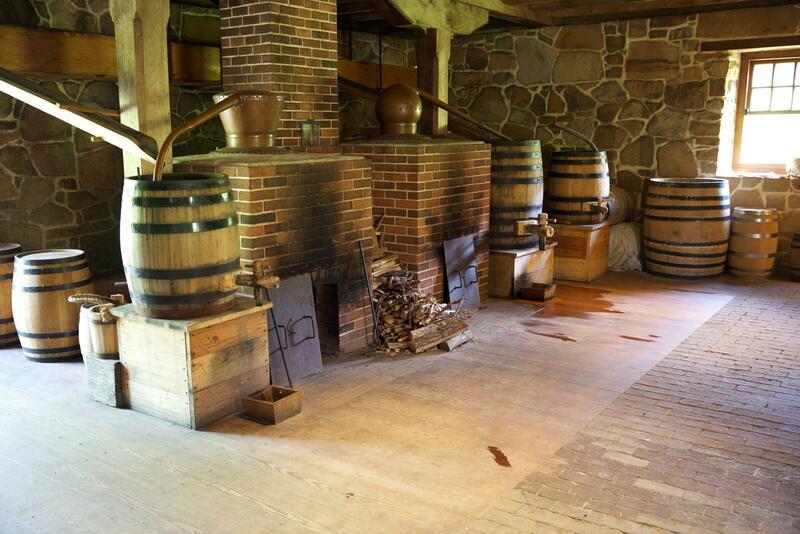 At its peak, Washington’s distillery produced over 11,000 gallons of rye whiskey, becoming one of his most successful enterprises. Even as President, Washington’s thoughts often turned to Mount Vernon. 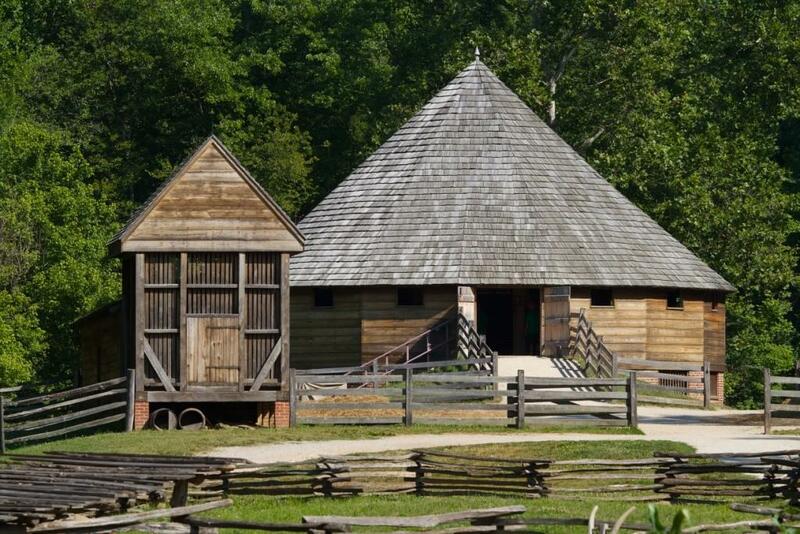 For example – while in office, he designed a 16-sided barn to thresh wheat in a more efficient and sanitary way. As horses circled the second floor, they treaded on the wheat that had been spread there, breaking the grain from the chaff. The wheat would fall through gaps in the floorboards to the first floor, where it was winnowed. After winnowing, the grain was taken to the gristmill and ground into flour. From the President’s House in Philadelphia, Washington followed the barn’s construction every step of the way. He even correctly calculated the number of bricks needed for the first floor – which turned out to be exactly 30,820! Take a look into the operation of the George Washington's automated gristmill. "First in war, first in peace, and first in the hearts of his countrymen." Learn more about George Washington. 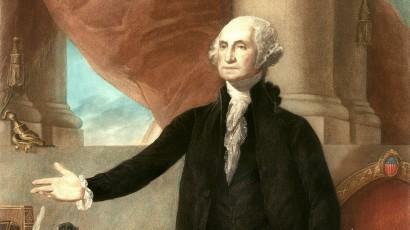 At age 11, George Washington inherited 10 slaves from his father. In those days in Virginia, the institution of slavery was considered “a given” and slaves, like land and other property, could be bought, sold, given away, rented out, and passed down through inheritance. As a young man, George was no different from other members of the Virginia planter class in his attitude that there was nothing morally wrong with slavery. When he married Martha, Washington more than doubled the number of slaves under his control through “dower slaves” that she brought to the marriage. In 1759, there were about 40 slaves living at Mount Vernon. Although Washington had control over the dower slaves as a result of his marriage, they were not his property; instead they belonged to the estate of Martha’s first husband. Washington’s enslaved manservant, Billy Lee, entered the war at Washington’s side and stayed with him throughout the revolution. Like his owner, Billy Lee was widely known as a courageous and expert horseman. 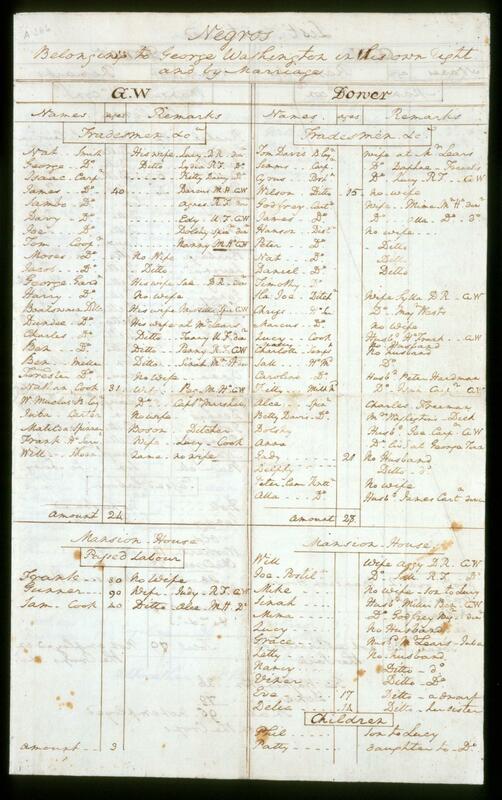 As Washington prepared his will, he drew up a list of the Mount Vernon slaves who belonged to either the Custis estate or to him. He found that altogether there were 316 enslaved men, women, and children living at Mount Vernon. Some of these individuals worked in the fields, while others were employed as house servants or as craftsmen in more than a dozen specialties ranging from blacksmithing, to spinning, to bricklaying, weaving, and cooking, to name just a few. At the time of the 1799 census, nearly half of Mount Vernon’s enslaved population was either too old or too young to work. Washington made provisions in his will to free all of his own slaves but could not free those (or the descendants of those) whom Martha had brought to the marriage. By Virginia law, her grandchildren would inherit her “dower slaves.” Because the two groups had intermarried, emancipation of Washington’s slaves proved bittersweet. By freeing his slaves, George Washington tried to set an example for others to follow. He was the only slaveholder among the founding fathers to free all his slaves. General Washington leads the Continental Army to victory; defeating the British, and ensuring independence. In June 1775, Congress commissioned George Washington to take command of the Continental Army besieging the British in Boston. He wrote home to Martha that he expected to return safely to her in the fall. The command kept him away from Mount Vernon for more than 8 years. It was a command for which his military background, although greater than that of any of the other available candidates, hardly prepared him. His knowledge lay in frontier warfare, involving relatively small numbers of soldiers. He had no practical experience maneuvering large formations, handling cavalry or artillery, or maintaining supply lines adequate to support thousands of men in the field. He learned on the job; and although his army reeled from one misfortune to another, he had the courage, determination, and mental agility to keep the American cause one step ahead of complete disintegration until he figured out how to win the unprecedented revolutionary struggle he was leading. His task was not overwhelming at first. The British position in Boston was untenable, and in March 1776 they withdrew from the city. But it was only a temporary respite. In June a new British army, under the command of Sir William Howe, arrived in the colonies with orders to take New York City. Howe commanded the largest expeditionary force Britain had ever sent overseas. Defending New York was almost impossible. An island city, New York is surrounded by a maze of waterways that gave a substantial advantage to an attacker with naval superiority. Howe's army was larger, better equipped, and far better trained than Washington's. They defeated Washington's army at Long Island in August and routed the Americans a few weeks later at Kip's Bay, resulting in the loss of the city. 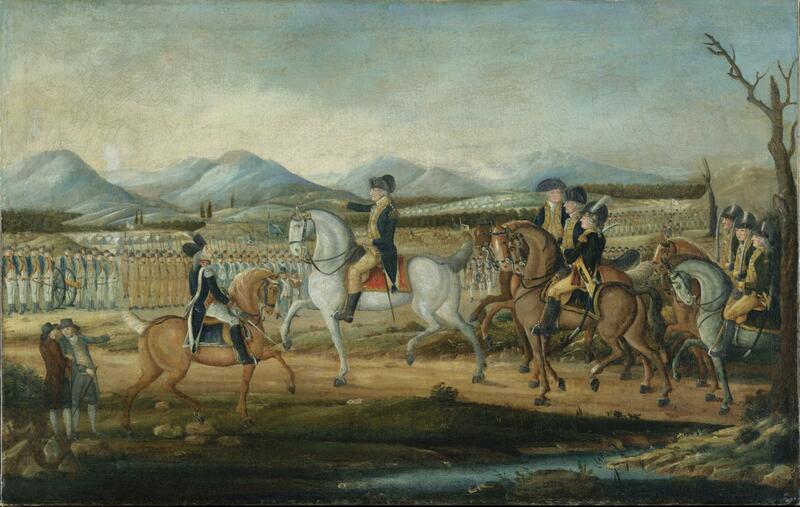 Forced to retreat northward, Washington was defeated again at White Plains. The American defense of New York City came to a humiliating conclusion on November 16, 1776, with the surrender of Fort Washington and some 2,800 men. 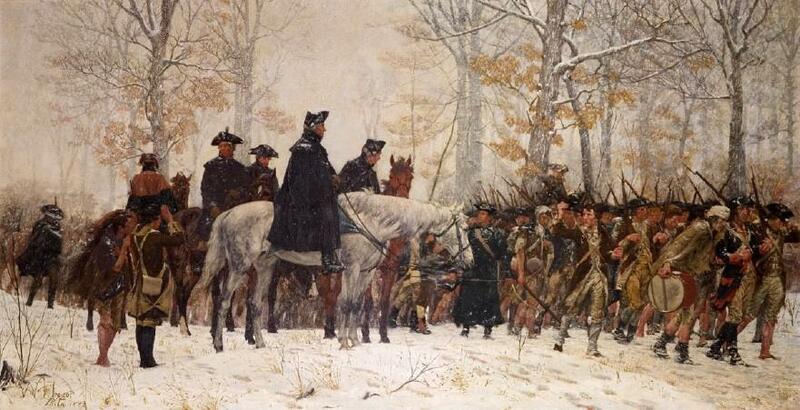 Washington ordered his army to retreat across New Jersey. The remains of his forces, mud-soaked and exhausted, crossed the Delaware River into Pennsylvania on December 7. For much of the remainder of the war, Washington's most important strategic task was to keep the British bottled up in New York. Although he never gave up hope of retaking the city, he was unwilling to risk his army without a fair prospect of success. An alliance with France and the arrival of a French army under the Comte de Rochambeau in July 1780 renewed Washington's hopes to recapture New York; however, together Washington and Rochambeau commanded about 9,000 men -- some 5,000 fewer than Clinton. In the end, therefore, the allied generals concluded, that an attack on New York could not succeed. Instead they decided to strike at the British army under Cornwallis, which was camped at Yorktown, Virginia. Washington's planning for the Battle of Yorktown was as bold as it had been for Trenton and Princeton but on a much larger scale. Depending on Clinton's inactivity, Washington marched south to lay siege on Cornwallis. On October 19, 1781, he accepted the surrender of Cornwallis's army. Although two more years passed before a peace treaty was completed, the victory at Yorktown effectively brought the Revolutionary War to an end (Map: Siege of Yorktown). To the world's amazement, Washington had prevailed over the more numerous, better supplied, and fully trained British army, mainly because he was more flexible than his opponents. He learned that it was more important to keep his army intact and to win an occasional victory to rally public support than it was to hold American cities or defeat the British army in an open field. Over the last 200 years revolutionary leaders in every part of the world have employed this insight, but never with a result as startling as Washington's victory over the British. On December 23, 1783, Washington presented himself before Congress in Annapolis, Maryland, and resigned his commission. Like Cincinnatus, the hero of Classical antiquity whose conduct he most admired, Washington had the wisdom to give up power when he could have been crowned a king. He left Annapolis and went home to Mount Vernon with the fixed intention of never again serving in public life. This one act, without precedent in modern history, made him an international hero. Who Was the Marquis De Chastellux? Step inside Washington’s boots in this first-person interactive leadership experience. Although Washington longed for a peaceful life at Mount Vernon, the affairs of the nation continued to command his attention. He watched with mounting dismay as the weak union created by the Articles of Confederation gradually disintegrated, unable to collect revenue or pay its debts. He was appalled by the excesses of the state legislatures and frustrated by the diplomatic, financial, and military impotence of the Confederation Congress. By 1785 Washington had concluded that reform was essential. What was needed, he wrote to James Madison, was an energetic Constitution. In 1787, Washington ended his self-imposed retirement and traveled to Philadelphia to attend a convention assembled to recommend changes to the Articles of Confederation. He was unanimously chosen to preside over the Constitutional Convention, a job that took four months. He spoke very little in the convention, but few delegates were more determined to devise a government endowed with real energy and authority. My wish, he wrote, is that the convention may adopt no temporizing expedients but probe the defects of the Constitution to the bottom and provide a radical cure. After the convention adjourned, Washington's reputation and support were essential to overcome opposition to the ratification of the proposed Constitution. He worked for months to rally support for the new instrument of government. It was a difficult struggle. Even in Washington's native Virginia, the Constitution was ratified by a majority of only one vote. 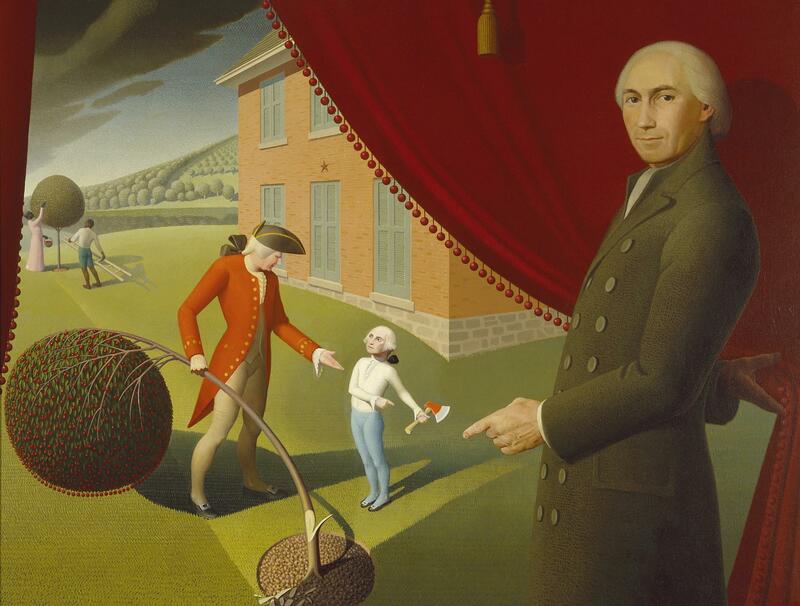 Once the Constitution was approved, Washington hoped to retire again to private life. But when the first presidential election was held, he received a vote from every elector. He remains the only President in American history to be elected by the unanimous voice of the people. Most popular revolutions throughout history have descended into bloody chaos or fallen under the sway of dictators. So how did the United States, born of its own 8-year revolution, ultimately avoid these common pitfalls? 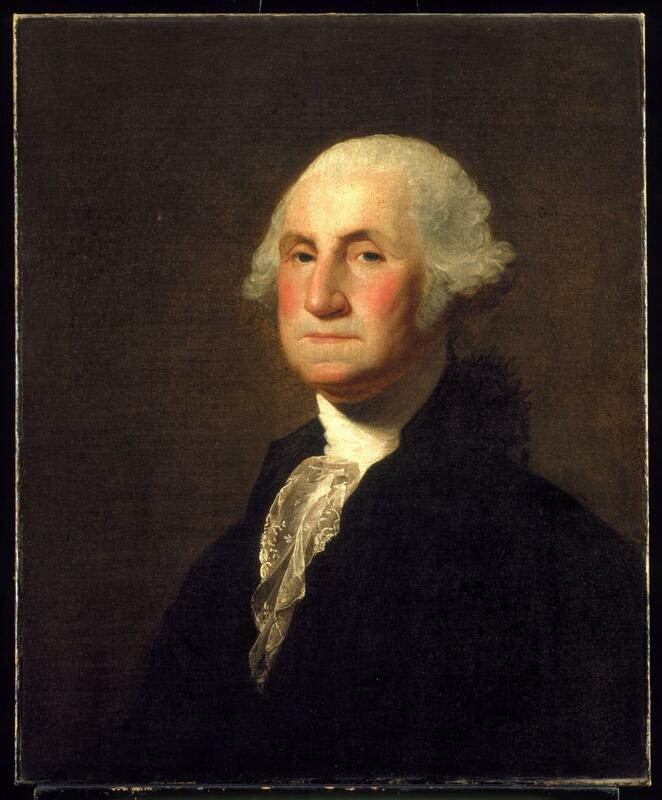 George Washington was unanimously elected President of the United States, twice. Washington served two terms as President. His first term (1789-1793) was occupied primarily with organizing the executive branch of the new government and establishing administrative procedures that would make it possible for the government to operate with the energy and efficiency he believed were essential to the republic's future. An astute judge of talent, he surrounded himself with the most able men in the new nation. He appointed his former aide-decamp, Alexander Hamilton, as Secretary of the Treasury; Thomas Jefferson as Secretary of State; and his former artillery chief, Henry Knox, as Secretary of War. James Madison was one of his principal advisors. In his First Inaugural Address, Washington confessed that he was unpracticed in the duties of civil administration; however, he was one of the most able administrators ever to serve as President. He administered the government with fairness and integrity, assuring Americans that the President could exercise extensive executive authority without corruption. 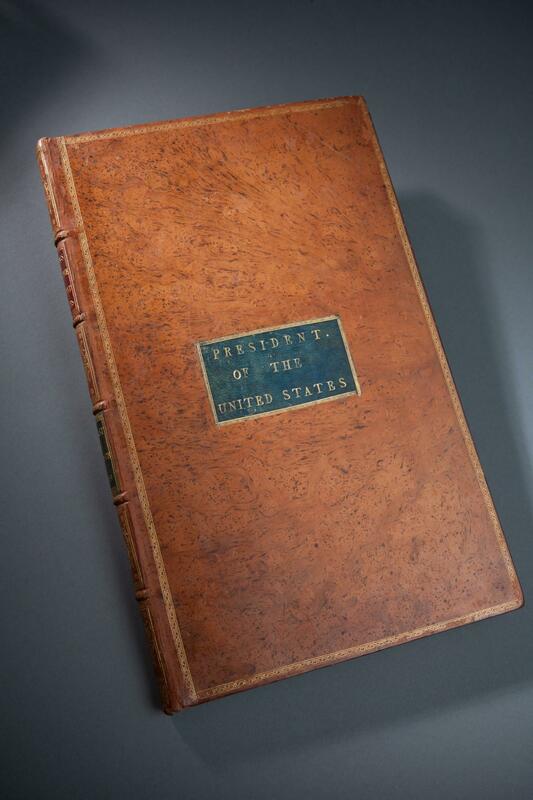 Further, he executed the laws with restraint, establishing precedents for broad-ranging presidential authority. His integrity was most pure, Thomas Jefferson wrote, his justice the most inflexible I have ever known, no motive of interest or consanguinity, friendship, or hatred, being able to bias his decision. Washington set a standard for presidential integrity rarely met by his successors, although he established an ideal by which they all are judged. During Washington's first term the Federal Government adopted a series of measures proposed by Alexander Hamilton to resolve the escalating debt crisis and established the nation's finances on a sound basis, concluded peace treaties with the southeastern Indian tribes, and designated a site on the Potomac River for the permanent capital of the United States. But as Washington's first term ended, a bloody Indian war continued on the northwestern frontier. The warring tribes were encouraged by the British, who retained military posts in the northwest. Further, the Spanish denied Americans use of the Mississippi River. These problems limited the westward expansion to which Washington was committed. Growing partisanship within the government also concerned Washington. Many men in the new government -- including Thomas Jefferson, James Madison, and other leaders of the emerging Republican party -- were opposed to Hamilton's financial program. Washington despised political partisanship but could do little to slow the development of political parties. During his first term Washington toured the northern and southern states and found that the new government enjoyed the general support of the American people. Convinced that the government could get along without him, he planned to step down at the end of his first term. But his cabinet members convinced him that he alone could command the respect of members of both burgeoning political parties. Thomas Jefferson visited Washington at Mount Vernon to urge him to accept a second term. Although longing to return home permanently, Washington reluctantly agreed. Washington's second term (1793-1797) was dominated by foreign affairs and marred by a deepening partisanship in his own administration. Washington assumed the Presidency on the eve of the French Revolution, a time of great international crisis. The outbreak of a general European war in 1793 forced the crisis to the center of American politics. 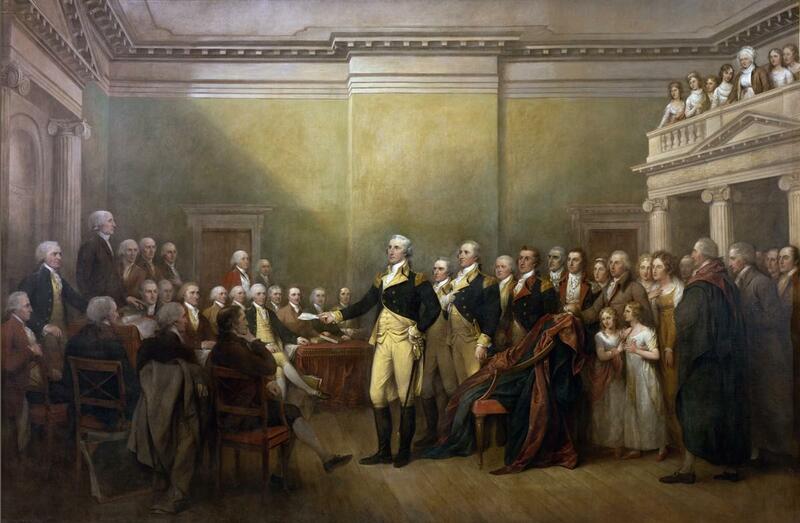 Washington believed the national interest of the United States dictated neutrality. War would be disastrous for commerce and shatter the nation's finances. The country's future depended on the increase in wealth and opportunity that would come from commerce and westward expansion. One of Washington's most important accomplishments was keeping the United States out of the war, giving the new nation an opportunity to grow in strength while establishing the principle of neutrality that shaped American foreign policy for more than a century. Although Washington's department heads agreed that the United States should remain neutral, disagreements over foreign policy aggravated partisan tensions among them. The disagreements were part of the deepening division between Federalists and Republicans. Opposition to federal policies developed into resistance to the law in 1794 as distillers in Western Pennsylvania rioted and refused to pay taxes. Washington directed the army to restore order, a step applauded by Federalists and condemned by Republicans. Despite Washington's disappointment with the rise of partisanship, the last years of his Presidency were distinguished by important achievements. The long Indian war on the northwest frontier was won, Britain surrendered its forts in the northwest, and Spain opened the Mississippi to American commerce. These achievements opened the West to settlement. 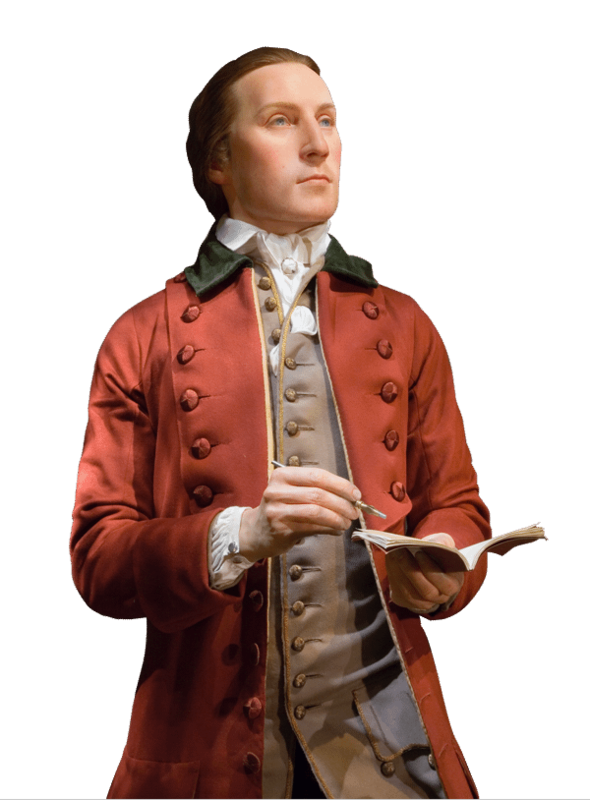 Washington’s Farewell Address helped to summarize many of Washington’s strongest held beliefs about what it would take to sustain and grow the young nation that he helped found. Finally retired from public service, George and Martha Washington returned to their beloved Mount Vernon. Unfortunately for Washington, his time at the estate would be short lived. On Thursday, December 12, 1799, George Washington was out on horseback supervising farming activities from late morning until three in the afternoon. The weather shifted from light snow to hail and then to rain. Upon Washington's return it was suggested that he change out of his wet riding clothes before dinner. Known for his punctuality, Washington chose to remain in his damp attire. Washington recognized the onset of a sore throat and became increasingly hoarse. After retiring for the night Washington awoke in terrible discomfort at around two in the morning. Martha was concerned about his state and wanted to send for help. Tobias Lear, Washington’s secretary, sent for George Rawlins, an overseer at Mount Vernon, who at the request of George Washington bled him. Lear also sent to Alexandria for Dr. James Craik, the family doctor and Washington's trusted friend and physician for forty years. As Washington’s condition worsened, two additional doctors were sent for and arrived at Washington’s bedside. Despite receiving a regimen of blood-lettings, induced vomiting, an enema, and potions of vinegar and sage tea, Washington’s condition worsened. Washington called for his two wills and directed that the unused one should be burned. Between ten and eleven at night on December 14, 1799, George Washington passed away. He was surrounded by people who were close to him including his wife who sat at the foot of the bed, his friends Dr. Craik and Tobias Lear, housemaids Caroline, Molly, and Charlotte, and his valet Christopher Sheels who stood in the room throughout the day. 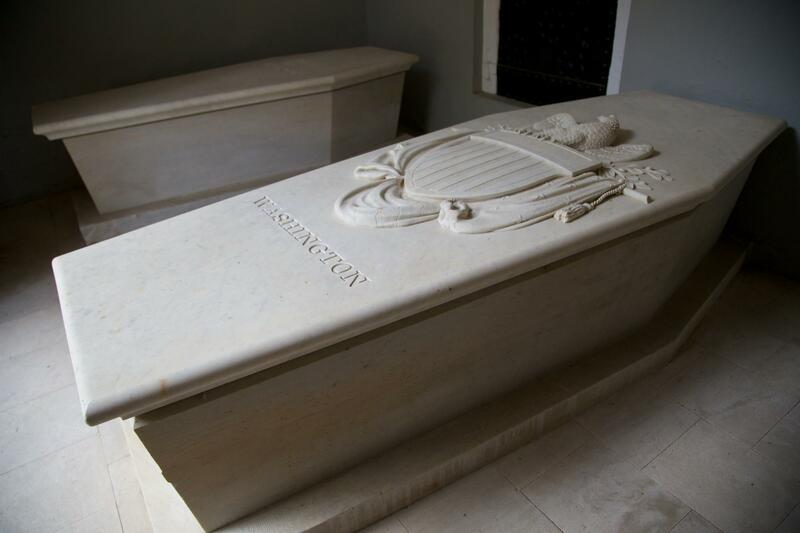 According to his wishes, Washington was not buried for three days. During that time his body lay in a mahogany casket in the New Room. On December 18, 1799 a solemn funeral was held at Mount Vernon. Do you know how George Washington died? 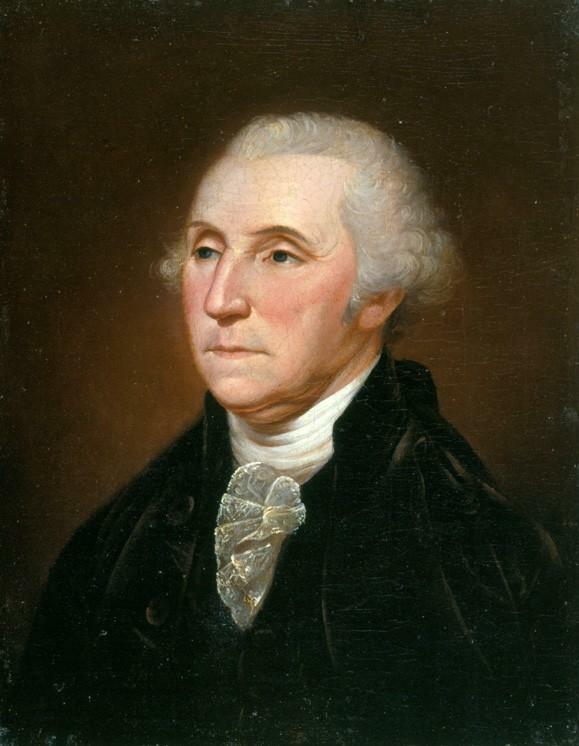 To his doctors in 1799, the cause of Washington's death was unknown. Today, our experts think they might know what his ailment was. George Washington traveled far and wide during his lifetime. Our Washington's World Interactive Map will help you discover all the journeys and places that Washington visited.